Most of the discussion around high soft costs in solar is focused on the residential sector, but the situation is not much better in the commercial market. Non-hardware soft costs make up nearly 60 percent of the total price for a flat-roof commercial PV system, according to GTM Research. Soft costs are decreasing, but slowly, and margins for commercial developers are being squeezed. Margins are expected to compress further in the coming years, while lower costs are enabling the commercial and industrial solar sector to take off. Last year was a banner year for non-residential distributed solar, according to GTM Research, with the market growing nearly 50 percent from 2015 to 2016 to more than 1,500 megawatts. That’s just a drop in the bucket, however. The National Renewable Energy Laboratory has identified more than a terawatt of potential rooftop solar capacity in the U.S., about one-third of which is on buildings with more than 5,000 square feet of rooftop area, which are largely commercial structures. By one NREL estimate, up to two-thirds of commercial roofs may be suitable for solar. The market is far from unlocking the full potential across commercial buildings in the U.S. “It is safe to say that no one has quite cracked the code on scaling that market,” said Shayle Kann, head of GTM Research, earlier this year. That is particularly true of commercial PV systems for small and medium-sized businesses, which is a largely underserved segment. “If you want to install many of these C&I projects in a cost-effective manner, your process can’t be bespoke," said Samuel Adeyemo, COO and co-founder of solar design software startup Aurora Solar. The more steps required, the higher the soft costs. As Robinson noted, the time needed to rework initial designs in the final part of the sales process is unsustainable at scale. 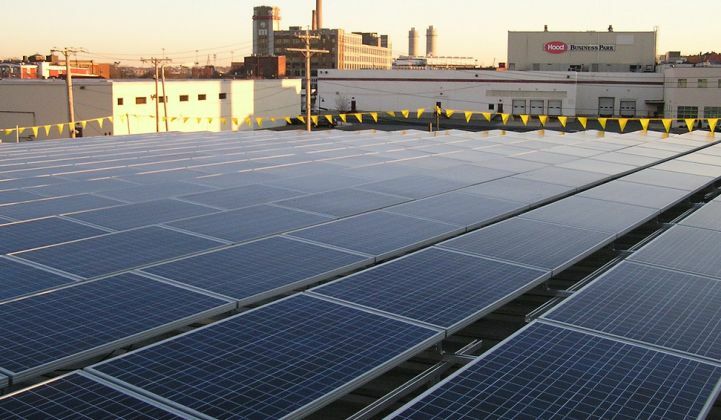 For commercial solar projects, there is usually some degree of design reworking that happens. “Most of the time, it can be substantial and costly,” said Christopher Hopper, CEO and co-founder of Aurora. That is where the real value of highly granular software comes into play a faster sales cycle is not about shaving minutes off the time it takes to create a design, it is about shaving weeks off the painful process of having to deal with a change order. Another little-known factor that can alter the economics of a design is the fact that modules with the same power rating can have different internal wiring and diode placement configurations. Aurora offers the option of simulating system performance at the cell-string level. This level of detail could result in 1 to 2 percent increase in forecasted system performance, especially for flat-roof commercial designs where inter-row shading might be a concern. A 1 percent to 2 percent increase in performance can add up to millions of dollars over the lifetime of a 20-year commercial solar PV system. Falling costs are allowing many large and small companies to consider solar on a purely financial basis and not just to meet sustainability goals. Some of those commercial customers are also getting more sophisticated as they move beyond their first project. “Design choice questions are increasingly financial questions,” said Adeyemo. While Aurora has long offered financial analysis for residential projects, it recently added the capability for in-depth financial analysis for commercial projects. End customers are increasingly asking about financial metrics, and answering their questions is getting more complicated. The sales process, for instance, might involve discussing depreciation tax shields, or the economic comparison between an onsite project versus a virtual PPA. This year California adopted its net energy metering (NEM) successor tariff, also known as NEM 2.0. While the ruling by the California regulators largely upholds the tenet that customers will earn retail-rate payments, it also moves net-metered customers to time-of-use rates, and introduces non-bypassable charges. Some elements of the change to net metering could lower the overall return on solar. But for now, “There are all these variables to play with,” said Adeyemo. For savvy commercial developers, that means designing a system not only for the highest energy output, but also to maximize revenue based on time-of-use rates and other considerations, such as non-bypassable charges.